JE Made Knives offers the classic Loveless New York Special in a slip joint platform with premium modern materials. 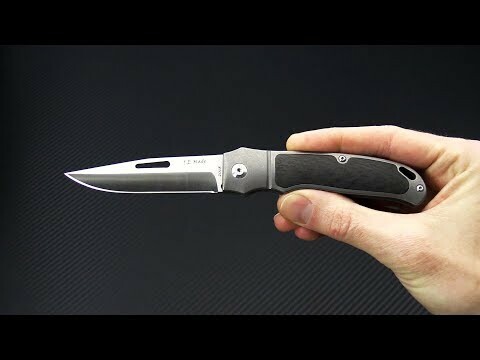 This knife has exceptional fit and finish and the walk and talk to prove it! This version comes with bead blast and tumble finished titanium handles with integral bolsters, Carbon Fiber inlaid "scales" and 3D Machined titanium pocket clip. Blade: Premium CPM S35VN stainless is finished with a beautiful satin finish and false edge clip point profile of the iconic Loveless New York Special design. The clip point and false edge deliver a powerful, piercing point while the mid-height grind offers a good combination of durability and cutting performance. Bronze washers deliver smooth operation with a half stop, slip joint action in the traditional style. A generous cutout in the blade is provided for opening. Handle: The full titanium handles are clean and ergonomic with a subtle dual guard, integral milled bolster and handsome carbon fiber inlays that reduce weight and look great. The tumbled, blasted finish on the titanium provides a matte gray finish that is discreet for use. The stainless steel back spring delivers a snappy action opening and closing and a generous key hole is included for lanyard attachment. CPM S35VN: Designed to offer improved toughness over CPM S30V, S35VN is easier to machine and polish than CPM S30V which makes for easier sharpening. The inclusion of Niobium allows for the formation of niobium carbides along with vanadium and chromium carbides. Substituting niobium carbides for some of the vanadium carbides makes CPM S35VN about 15-20% tougher than CPM S30V without any loss of wear resistance. The improved toughness of S35VN gives it better resistance to edge chipping.